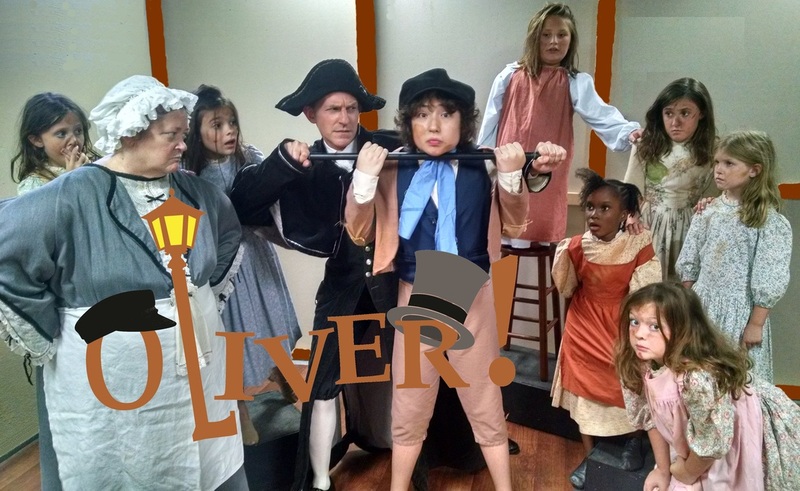 The Broadway Bound Vista Theatre Project played to capacity houses for each performance of Lionel Bart’s exuberant musical OLIVER!, which ran July 9-12 in the Columbia Music Festival Association’s ArtSpace at 914 Pulaski Street. A Tony Award-winning classic, OLIVER! is the musical retelling of Charles Dickens’ Oliver Twist. The story tells of a child who is sold by a London orphanage because he asks for more food. The boy eventually escapes to the streets of London, finding adventure and seeking a loving home. Jadon Stanek played the title role of the orphaned Oliver, with Lee O. Smith as the miserly Fagin, Shelby Sessler as the goodhearted Nancy (a role handled by Hannah Mount for the June 11 matinee), Mattie Mount as the Artful Dodger, and Allen Inabinet as the evil Bill Sykes. Tracy Steele and Cindy Durrett were the comically villainous Mr. Bumble and Widow Corney, Charley Krawczyk and Jami Steele were the funereal Mr. and Mrs. Sowerberry, and Scott Stepp was the kindly Mr. Brownlow, joining pickpockets, workhouse children, and Londoners of all ages in the 50-member cast that brought Dickens’ characters to life. OLIVER! was directed and choreographed by Dedra Daniels Mount, with musical direction by Christopher Cockrell. Shelby Sessler designed the period costumes, and Scott Stepp oversaw creation of the multi-purpose set. A silent auction of Oliver Twist-inspired items was held before each performance as a fundraiser for the Broadway Bound Vista Theatre Project, a new non-profit community-based musical and dramatic performing arts organization created to present quality family entertainment and to provide opportunities for children and adults to develop talents in all aspects of theatre arts. OLIVER! was sponsored by Ken & Cheryl Wheat, with additional support by Ed & Megan Davis, Ann Burns, Jordan Samuels, and the family of Dale & Heather Wolan. Performances were 8 p.m. July 9-10; 3 p.m. and 8 p.m. on July 11; and 3 p.m. on July 12. Tickets were $15. The CMFA ArtSpace is located at 914 Pulaski Street in Columbia’s Vista.